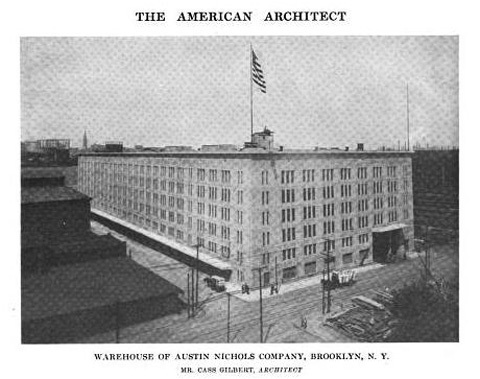 Warehouse of Austin Nichols Company. Courtesy of American Architect and Architecture - Vol 107. In 1915, Austin Nichols & Co., the largest wholesale grocers at the time, moved from lower Manhattan's wholesale food district-- today's TriBeCa-- to a new superblock site on the Williamsburg waterfront. The imposing structure was designed by Cass Gilbert, architect of the just-completed world's tallest skyscraper, the Woolworth Building. Developed as a warehouse and production plant where goods were prepared, processed, and packaged under the Sunbeam Foods label, the immense plant provided 450,000 sq. ft. of floor space on four floors. Financiers Havemeyer & Elder, who owned the nearby sugar refinery, directed Gilbert to make the Manhattan (west) fa�ade monumental in appearance to publicize the factory and the expanding rail terminal. The reinforced-concrete structure, built by Turner Construction Company in the Ransome patented system, was lauded as a "Model of Modern Construction and Efficiency" (Brooklyn Daily Eagle) and won praise from European Modern architects, Le Corbusier and Walter Gropius. In 2009, the building has been redeveloped as a 300-unit residential complex.